Children enjoyed experiencing the garden, with its innumerable bees, butterflies, and flowers. Photo by Clynt Dudleson. 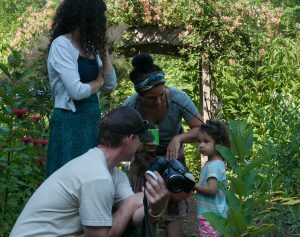 On June 19, 2018, more than 50 people gathered in Asheville, North Carolina to experience pollinators and native plants. They were celebrating National Pollinator Week. Buncombe County Extension Master Gardeners and the USDA Forest Service Southern Research Station organized the event. Asheville GreenWorks, Bee City USA, the U.S. Fish and Wildlife Service, and many others helped make it a success. The SRS Pollinator Garden features almost 60 native plant species. It is a lovely and beloved resource. But it doesn’t save bees by having plants in it, says Diane Almond, EMG volunteer and beekeeper. “The pollinator garden is going to save bees by having people in it,” she commented. Everyone relies on pollinators. It’s estimated that one out of every three bites we eat is made possible by pollinators. 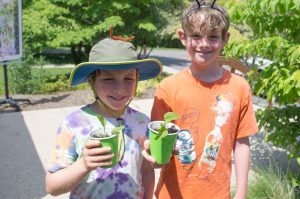 At the event, gardeners, scientists, and educators shared such facts – along with their expertise and contagious enthusiasm. Bryan Tompkins (USFWS) introduces visitors to a bumblebee. Photo by Michael Robinson, USFS. Many of the visitors were children. The adventure began with a transformation. Visitors donned antennae, becoming bees, beetles, butterflies, or hoverflies. Hoverfly antennae are stubby and brown, beetle antennae are long and curved, and so on – each group is unique. Christine Brown of Asheville Greenworks helped visitors make the antennae out of pipe cleaners, and EMG volunteer Marie Drum greeted them. 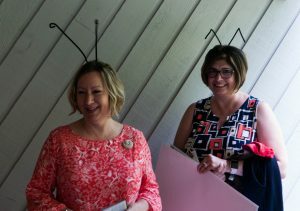 SRS employees Jennifer Parsell and Tina Bailey prove that antennae aren’t just for children! Photo by Michael Robinson, USFS. Up the stairs the beetles climbed, and when they reached the top, EMG volunteer Mary Fierle and SRS volunteers including office automation assistant Linda Cortes welcomed them. Brochures and handouts were available, plus free Trees for Bees posters, donated by the USDA Natural Resources Conservation Service. Clutching their cups, they were off on a Bee ID Walk with U.S. Fish and Wildlife Service biologist Bryan Tompkins. Tompkins is documenting bumblebee diversity in western North Carolina. The balcony bustled with activity. 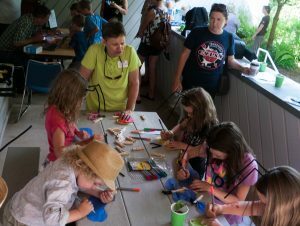 Suzanne Wodek helped kids create clothespin butterflies. Photo by Michael Robinson, USFS. Around the corner, a redbud tree provided shade and a chance to hear about the garden’s history. Two of the garden’s founders were there – EMG volunteer and beekeeper Diane Almond and biological information specialist Stephanie Worley Firley. They helped establish the garden in 2009 and shepherded it through the early years. 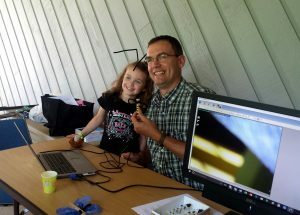 The balcony bustled with activities – two craft activities and a bee viewing, by microscope. Mayfield held a small digital microscope over pinned bee specimens. The tiny bees were magnified on a computer monitor. The tiniest specimen was a sweat bee from the Halictidae family. One young visitor made a clothespin butterfly as a gift for Mayfield. USFS photo. “It’s quite safe and fascinating to hold a sweat bee in your hand and watch it crawl around as it gathers salt from your skin,” wrote Remi Shaull-Thompson, in a fact sheet about the specimens. Shaull-Thompson is a Princeton student and PICS intern at SRS. The microscope activity was popular. “The complexity of magnified insects fascinated the kids who stopped by,” says Mayfield. One small visitor even made a butterfly for Mayfield, at the adjacent butterfly creation station. The butterflies featured brilliantly colored wings and googly eyes, glued onto clothespins by EMG volunteer and horticulture therapist Suzanne Wodek. At another table, children enjoyed Bee A Scientist coloring books with Shaull-Thompson. The coloring books are produced by the FS and the Cradle of Forestry in America Interpretive Association and were provided by the Natural Inquirer. Many of the visitors left with plants and seeds for starting their own pollinator gardens. Photo by Clynt Dudleson. Visitors also picked up free milkweed seeds – either butterfly milkweed (Asclepias tuberosus) or common milkweed (Asclepias syriaca). Like all milkweeds, the leaves of both species provide food for monarch caterpillars, as well as other insects such as milkweed bugs. Their flowers provide nectar to many pollinating insects, although the unique flower structure can ensnare small insects, who die if they cannot pull their legs out of the slits between the flower anthers. The SRS Pollinator Garden is located at Station Headquarters in Asheville, NC. It was established in 2009 and is part of the USDA People’s Garden Program. 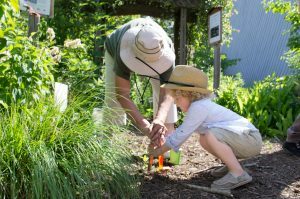 Read more about gardening with native plants. For more information, email SRSPollinatorGarden@fs.fed.us.